Rajasthan Dayis celebrated on 30th March every year on which the state Rajasthan came into existence as it was previously known as Rajputana. NTPC-Simhadri was also setting up a flue-gas desulphurisation plant (FGD) like the other thermal stations of the company. It had four units 500 MW each. Shanghai’s Hongkou has become the world’s first district using both 5G coverage and broadband gigabit network as China seeks to establish lead over the US and other countries in the race to develop next generation cellular mobile communications. Zuzana Caputova has won Slovakia’s presidential election, making her the country’s first female head of state. A member of the Progressive Slovakia party, Caputova won 58.3% votes after results from 98.1% of the voting districts were counted. Caputova defeated European Commission Vice President, Maros Sefcovic, who was backed by the ruling party, SMER-SD. Five other species have also made it to threatened categories: two wild orchids, the Arabian scad (a marine fish) and two wild coffee species found only in a few localities in the Western Ghats. In Assam, the Bongaigaon district administration has developed a mobile app Sankalp to particularly reach out to the first-time voters. It is a special initiative has been taken to encourage the first-time voters. NIC team has developed the app. The first-time voters on their mobile phones, requesting them to download the ‘Sankalp’ app. The new voters will also be able to sign a digital ‘sankalp patra’ to cast their votes on the day of polling. A forest guard of Nagaland named Alemba Yimchunger had been conferred with the ‘Earth Day Network Star Award’ by Earth Day Network, an international environmental NGO based in United States. Yimchunger who works as a forest guard at Fakim Wildlife Sanctuary in Kiphire district has been honoured with the prestigious award for his efforts in conserving biodiversity in and around the wildlife sanctuary. The Earth Day Network Star award is a prestigious recognition of those who do excellent work in the environmental field. The Peabody Awards board of jurors announced that Rita Moreno will receive the 2019 Peabody career achievement award. The actress will add the honor to her long list of awards, including an Oscar, a Tony, two Emmys and a Grammy. She is one of the 15 people to win the coveted EGOT quartet of elite awards. The 78thAnnual Peabody Awards will take place on May 18 at Cipriani Wall Street in New York. ICICI Securities appointed Vijay Chandok as an additional director and as a Managing Director and CEO of the company with effect from May 7, 2019. He will succeedShilpa Naval Kumar. Vijay Chandok, presently Executive Director of the ICICI Bank, has tendered his resignation from the board of the bank to take effect at the end of day on May 6, 2019. It is the first CMS to be developed by private industry for Indian Navy and for indigenous aircraft carrier. Indian Navy has received Combat Management System (CMS) for first indigenous aircraft carrier, INS Vikrant. It has been privately co-developed by Tata Power Strategic Engineering Division and Electronics System Engineering Establishment and MARS of Russia. 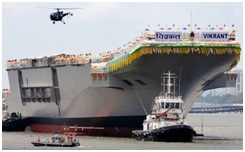 It is India’s first indigenously-built largest aircraft carrier. It is also called IAC-1. It is in its third and final phase of construction at Kochi shipyard and the sea trials are expected to begin by mid-2020. Garden Reach Ship Builders and Engineers Ltd (GRSE) became the ‘first Indian shipyard’ to build and deliver 100 warships. GRSE Chairman and Managing Director,V K Saxena, formally handed over the 100th warship ‘IN LCU L-56’ to the Indian Navy. 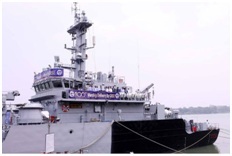 It had handed over its 99th warship, ‘ICGS Priyadarshini’, an advanced ‘Fast Patrol Vessel’ to the Indian Coast Guard. The 100th warship, a Landing Craft Utility (LCU), is the sixth of an order of eight such vessels from the Navy. 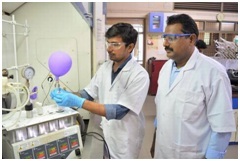 Indian Institute of Technology (IIT) Madras has successfully converted petroleum waste-product toluene into benzoic acid. Benzoic acid is used as a food preservative (E210) and medicine for fungal/bacterial infection. Toluene is converted into benzoic acid through selective and controlled oxidation in the presence of a catalyst — binaphthyl-stabilised platinum nanoparticles (Pt-BNP). Tesla has developed its ‘largest power storage system in Asia’ at Osaka train station in Japan to reduce energy demand and provide emergency backup power to trains in Japan. It has installed a bank of 42 Powerpacks at a train station in Japan’s Osaka that can provide sufficient backup power to safely move a train and its passengers to the nearest station in the event of a power outage. India and the United States signed the First Amendment to the Statement of Guiding Principles (SGP) on Triangular Cooperation for Global Development, mainly focused on Asia and Africa. It renews SGP agreement, which was signed by both countries in November 2014. It extends its validity up to 2021. It also expands scope of capacity building activities undertaken jointly by India and US under this framework. India and US will continue to offer capacity building assistance to partner countries in multiple sectors, focusing primarily on agriculture, trade and investments, nutrition, health, water, sanitation, education, women empowerment, regional connectivity, clean and renewable energy, disaster preparedness and institution building. It will help to fulfil India-US joint commitment to work together and leverage their combined capacities to provide demand-driven development partnership. 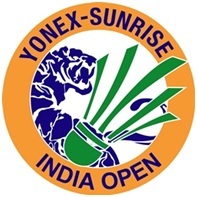 India’s Kidambi Srikanth lost in straight games to former world champion Viktor Axelsen of Denmark at the Yonex-Sunrise India Open badminton tournament 2019 in New Delhi. The 2019 India Open was held at K. D. Jadhav Indoor Hall in India.